Easily read correct pin configuration of 10baseT, 10base2, RJ45/RJ11 modular cables, 258A, TIA568A/568B, token ring, etc. Test installed cables either on wall plate or patch panel from a distance. Check for cable continuity, miswiring, open, short, grounding, and pin configurations. 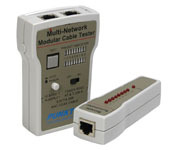 Cable adaptors�GRJ45 M-M, 2 RJ45MBNCF BNC M-M.
On-board connectors�G2 RJ45F (tester), 1 RJ45F (remote).